The restaurant is small and the cozy nature of it really appealed, not to mention the smiling face of the lady who seated us. I found out later that Maggie is the owner/chef’s wife. 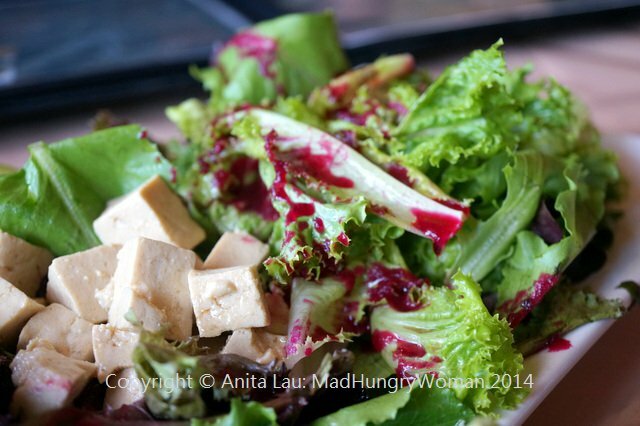 Naturally, on a first visit, I always order way too much food because I want to try everything, but before we even ordered, a complimentary salad arrives with some home made tofu alongside. The beet and raspberry salad dressing — also made in-house — was delightfully tart with a hint of sweetness. The tofu was absolutely incredible. Not only was it texturally pleasing, but it possessed the robust flavors of soy beans that I know and love. 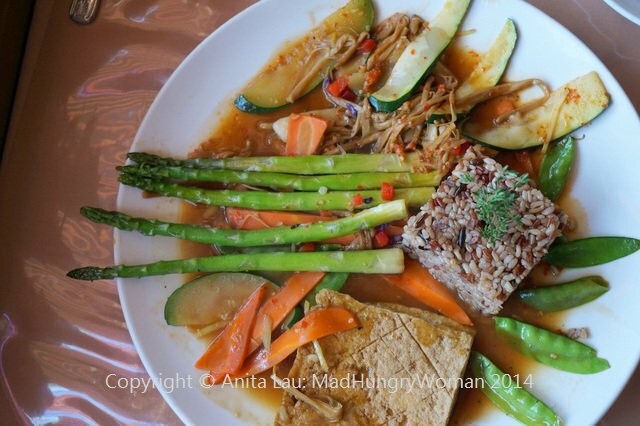 This is why we wanted to encompass more tofu into our meal. The Lily Flower with Asparagus and Oyster Mushrooms ($12.98) was selected because I love lily flower. It was just a bonus that a wedge of fried tofu was present on the plate. All plates arrive with your choice of white, brown or half/half rice. We opted for brown throughout. When asked what spice level you want, don’t go crazy like I did. I told Maggie 10. She put me in my place when she told me 5 was sufficient. We negotiated a 5 for the first dish and later, I went up one level to 6. Seeing I am able to eat habanero-level heat, and a 6 was hot enough, I would like to warn others before they try to order on the Orange County heat level I am accustomed to. Trust Maggie when she tells you it’s hot enough! 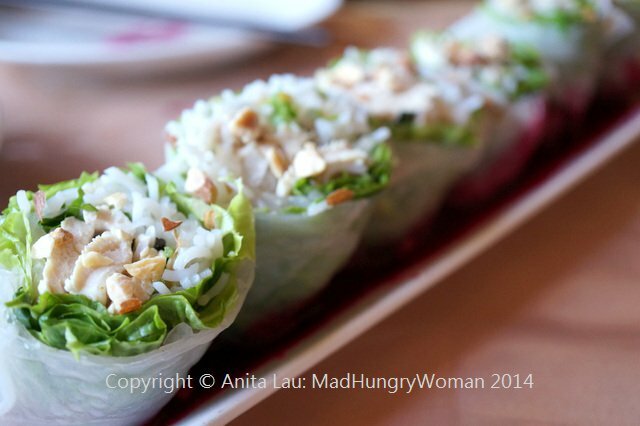 We started with some Chicken Salad Rolls ($8.28), a take on the Vietnamese rice paper rolls stuffed with lettuce, mints, cilantro, bean sprouts and rice noodles. They are cut in half and sits on a plate of house sauce similar to the dressing on the salad, but just a hint sweeter. Both my friend and I love chicken wings so an order of Garlic Chicken Wings ($8.36) was on the agenda, but first, I had Maggie confirm it wasn’t a sweet sauce the wings were doused in. She assured me it wasn’t. 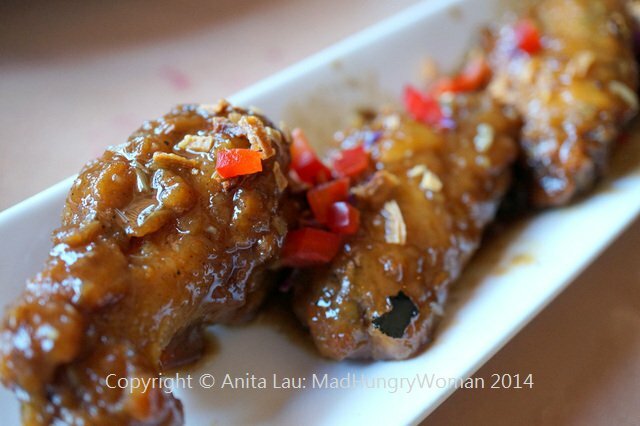 These fried chicken wings are coated with a savory garlic sauce which are perfect on their own, or accompanied with a bowl of steamed rice. So good! Maggie recommended the next dish, Stuffed Tofu, Eggplant and Peppers ($12.11), what we refer to as ‘yong dao fu’. 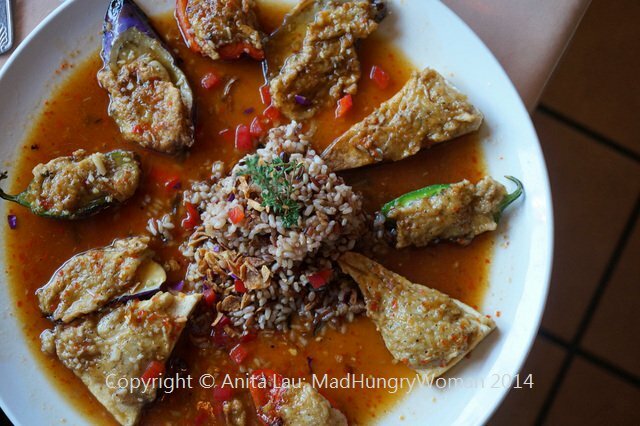 The tofu, eggplant and peppers are stuffed with fish paste and lightly pan fried before they are topped with a piquant spicy sauce. 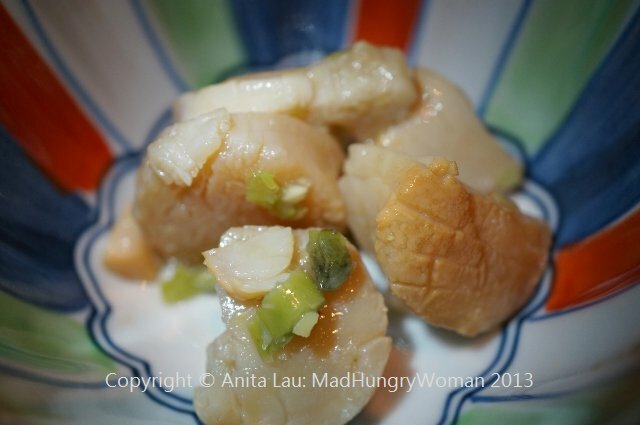 Typically, fish paste tends to be hard and with a fish ball-like texture. 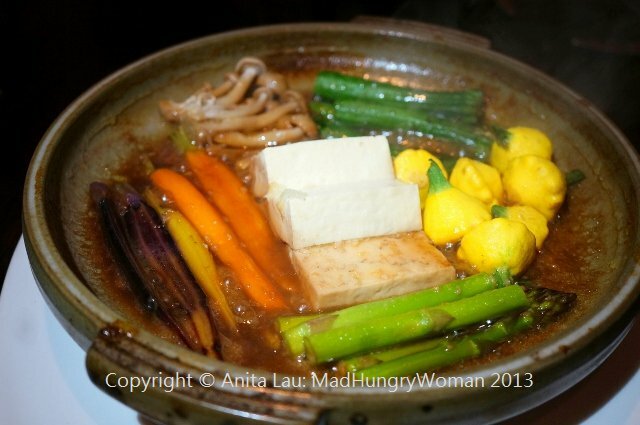 Here, it is soft and complements the vegetables perfectly, especially the tofu. 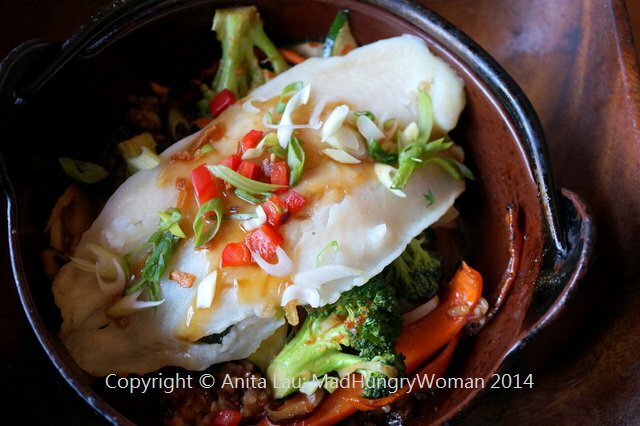 Wild Steamed Red Snapper Rice Pot ($13.88) was positively our favorite. Brown rice is topped with steamed snapper fillets with a sauce seasoned with ginger, garlic, wine, scallion and cilantro. 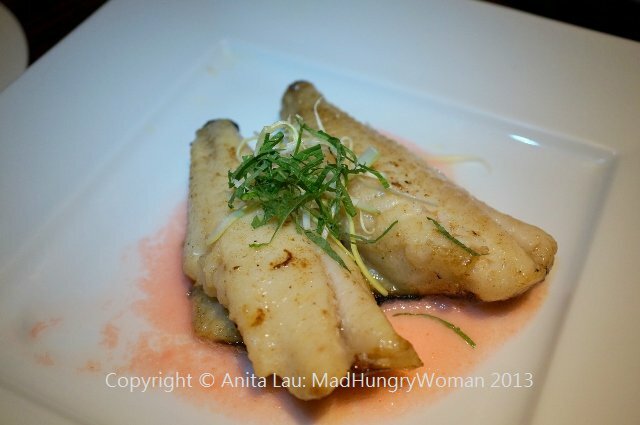 The delicate fish is not inundated with sauce so you’re able to taste it on its own, or, with the sauce-seasoned rice. The shiitake mushroom slices enhanced the flavors providing us with various tastes with each mouthful. We couldn’t stop eating this! When we were done, Maggie brought complimentary ice cream (all guests receive this) to us and continued chatting to me in Cantonese. This is when I found out that her husband Eric started making tofu with no experience whatsoever, perfecting it through the years. She is delighted that her customers love their food and especially, the tofu. She explained that the tofu is organic and Eric insists on creating everything from scratch right down to making the noodles they serve. I was bummed I didn’t know about this sooner, but will definitely return and order noodles on my next visit. There are a ton of vegetarian dishes available which appeal to non-vegetarians as well so there is something for everyone. I wish we had something similar in Orange County, but the closest thing we have is Dao Son, a shop selling home-made tofu in Westminster. There is no Chinese chef in OC making his own tofu and noodles that I know of. Do you? I’ll have to admit, Buena Park isn’t one of my usual eating destinations, but I am always game to try something new. Several weeks ago, I was invited, along with two other writers, to visit this restaurant serving both Japanese and Korean fare. The plaza it is situated in is busy! Extremely busy! I won’t lie, parking is a struggle and I am lucky to find one after circling around several times. Once inside, the restaurant is modern, chic and comfortable with beautiful wooden tables finishing off the decor. 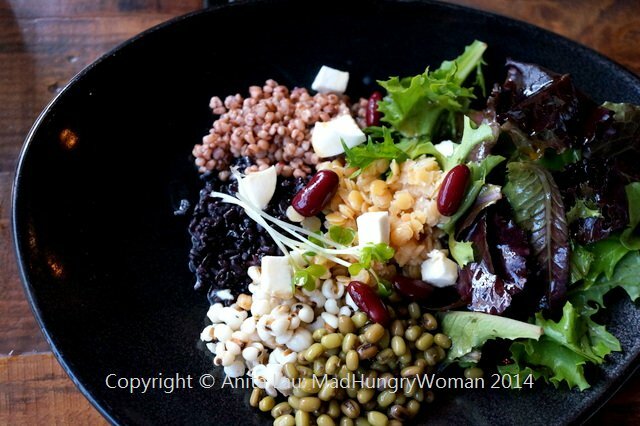 Whole Grain Salad ($9) screams modern Korean fusion marrying black rice, Indian millet, lentil, kidney beans and Job’s tears (Chinese pearl barley) together. This is also the basis of multi-grained Korean rice you can purchase at the market. I love the nutty texture and its nutritional value, but most of all, when tossed together with the mesclun leaves, fresh mozzarella bits in a soy vinaigrette, it is a delicious vegetarian dish to share or enjoy on your own. 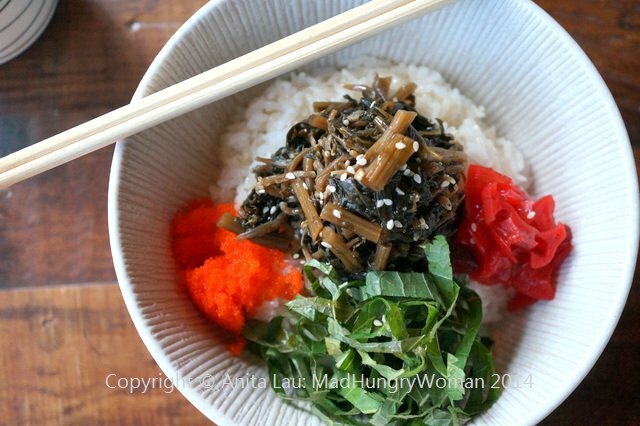 I absolutely adored Siraegi ($7), a rice bowl topped with dried radish greens, baby anchovies, masago and radish sprouts. Soy dashi (stock made from dried bonito shavings) seasons the radish greens, making this not only light, but refreshing. I love anchovies and radish greens so for me, even though this isn’t typically Chinese, I find it extremely comforting and satiating! 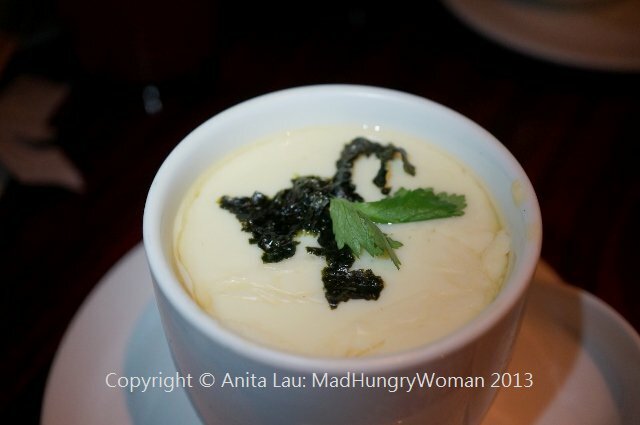 Jawanmushi ($4/$16) is a Japanese steamed egg custard which I often make at home. I usually make it plain, but at Dami, they make it the traditional way with shrimp, gingko nut and shiitake mushroom. 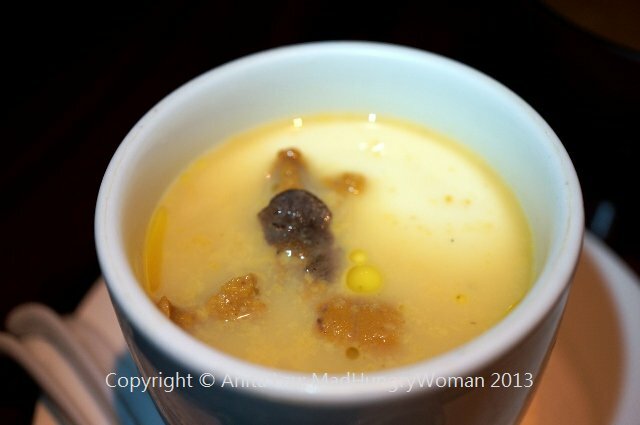 The custard was just a tad too firm for me but the flavor of the dashi used was spot on. 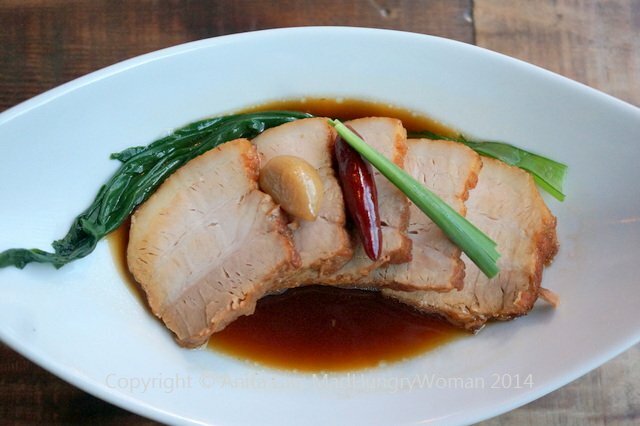 A side dish we tried was Buta-Ka-Kuni ($6.50), braised pork belly, with bok choy and green onion. I didn’t care for the under-seasoned pork which also needed more color as well. It was beautifully presented, but was underwhelming. 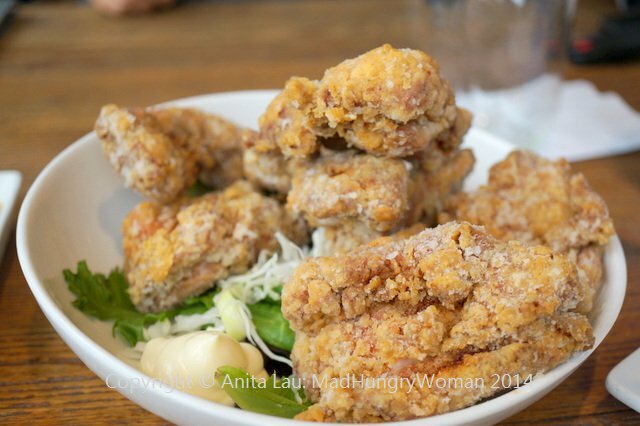 One of my favorite items was Yoshi’s Owari Chicken Wings ($10) Perfectly deep fried chicken wings with Yoshi’s secret seasoning are so crispy on the outside, and so moist on the inside. I couldn’t stop eating these. 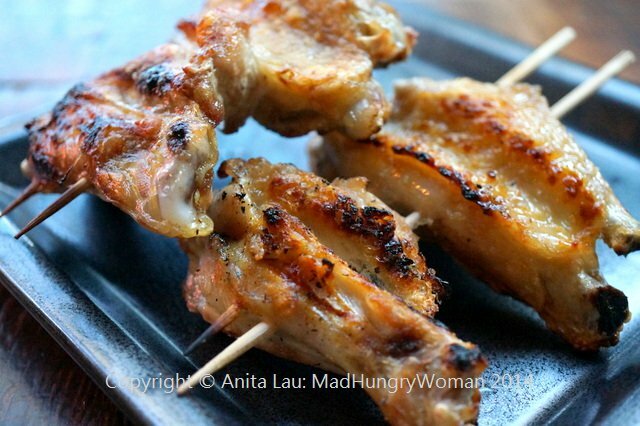 There is nothing more pleasing than well-cooked chicken wings. 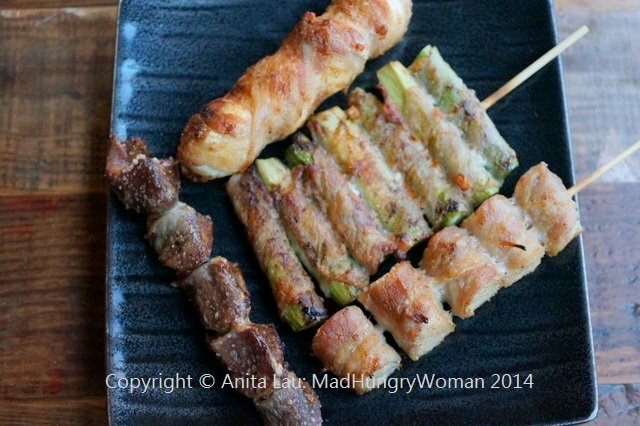 Because the restaurant had “izakaya” in its name, I insisted we try some yakitori. Asparagus Maki ($3), Enoki Mushroom Maki ($3), Quail Egg Maki ($4) and Chicken Gizzard ($2.75) were all stellar, especially the enoki wrapped inside slices of pork belly. Chicken Wing ($3.75) skewers are also delicious, but then again, I love chicken wings and these possessed a nice smoky flavor. 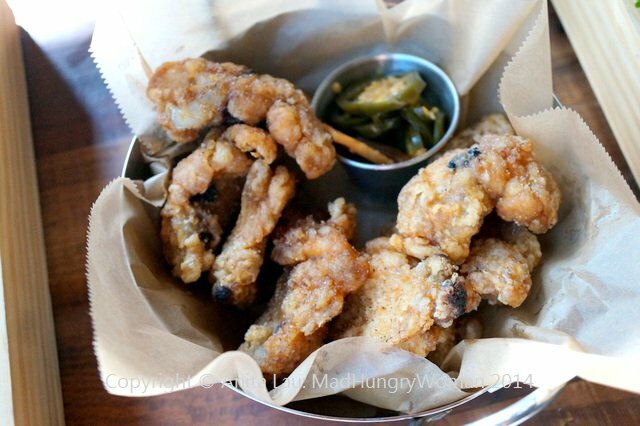 However, between this and the Yoshi’s Owari chicken wings, definitely choose the latter. 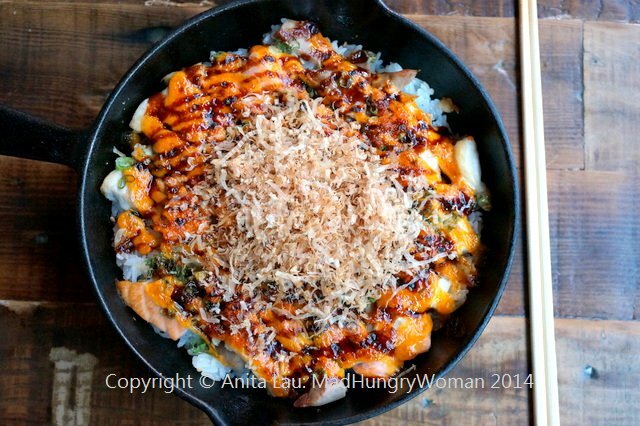 Cast Iron Rainbow Rice ($11) consists of assorted fish topped with tempura crunch and masago (flying fish roe) is grilled in an iron skillet and drizzled with a sweet unagi sauce. 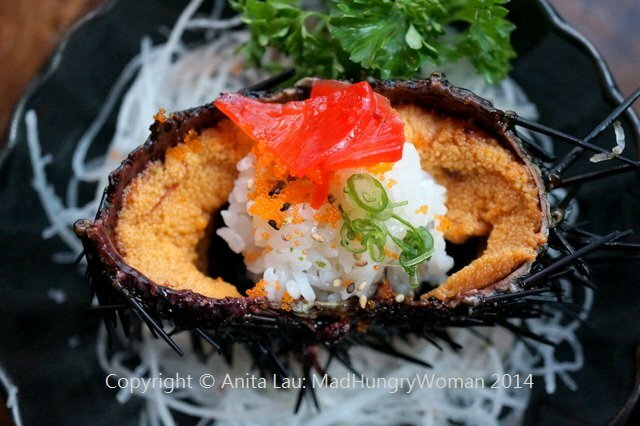 This isn’t a dish for me, but if you don’t care for raw fish, it is definitely for you. I really enjoyed the low-carb Dami Special Roll ($13) which doesn’t involve any rice whatsoever. 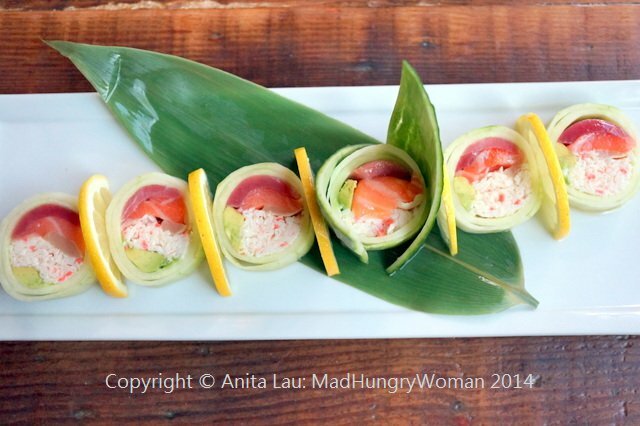 This crab roll sees tuna, salmon, albacore, crab meat and avocado wrapped with cucumber instead of rice and nori. So light and those on a low carb diet can enjoy as well. For me, the piece de resistance of the meal was the Live Uni with Sushi Rice ($12), presented in the uni shell, layered with rice around the delectable uni (sea urchin), and topped with sesame oil, pickled radish and masago (capelin roe). Beautiful to look at, and like butter in my mouth. 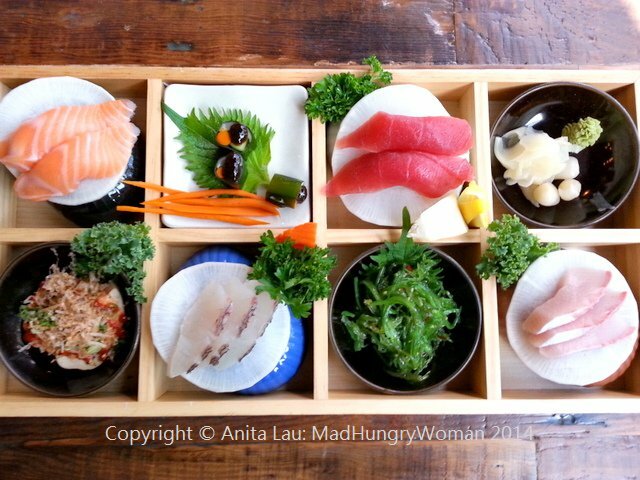 If you’re indecisive, then Dami Seafood Box ($40 recommended for two) with eight dishes including assorted seafood and sushi is just the thing for you. If you are sharing, you will definitely need to order more food because I can easily polish this off all by myself. The chef will prepare your box with the freshest fish available so the variety of fish will change from day to day. On the day of our visit, there was lobster available and this is the icing on the cake. Definitely order this if it is offered. Lobster Two Ways ($30) is presented as lobster sashimi, and then, the carcass is used to make a lobster stew that you can enjoy after you’ve eaten all your sushi and sashimi dishes. 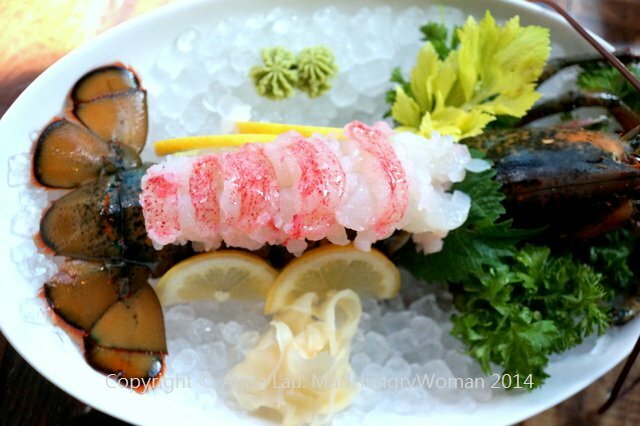 The raw lobster is sweet and filled with umami. I wish I didn’t have to share. The lobster stew arrives in a pot that continues to simmer at the table and is so umami-filled I wish I had enough room to enjoy it over a bowl of rice. But I brought the rest home and loved eating every minute of it the following day. 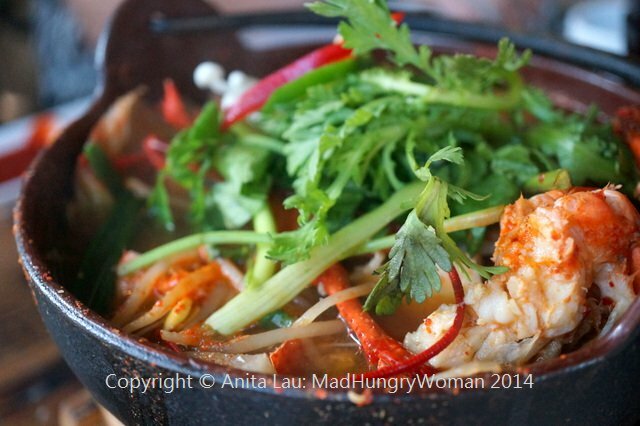 I loved the chrysanthemum leaves used to fragrance the broth already perfumed with the intoxication scent of lobster. Dami is one of those places I can go with my son, and we’ll both be very happy. The food is good and the surroundings extremely pleasant. This week I have two $50 gift certificates to Dami Sushi for two of you to WIN. Leave me a comment with why you would battle the parking situation to dine here. Entries close Sunday. Best of luck! It’s been over a year since I first encountered Rakiraki on a trip to San Diego. If I had to sum this eatery up in a sentence, it would be “love at first bite”. Since then I’ve been back several times whenever I get the opportunity. 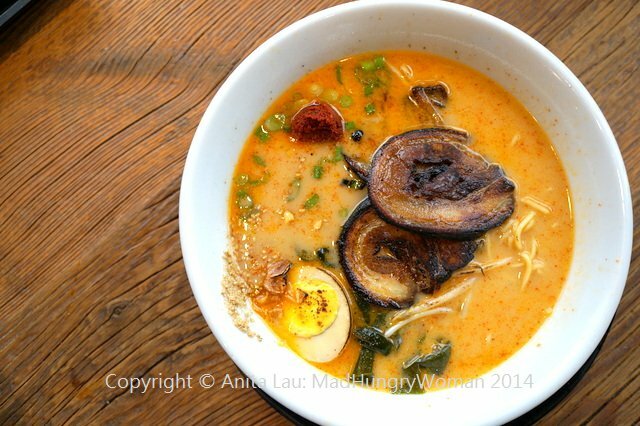 Driving to San Diego always means a bowl of ramen at some point, sometimes late at night, but this time, I met a group of friends for lunch and find a completely revamped menu, thankfully, with my favorites still intact. We start with some Farmers’ Market Fresh Cucumbers and Tomatoes ($4.95), a perfect way to whet your appetite and get those tastebuds going. 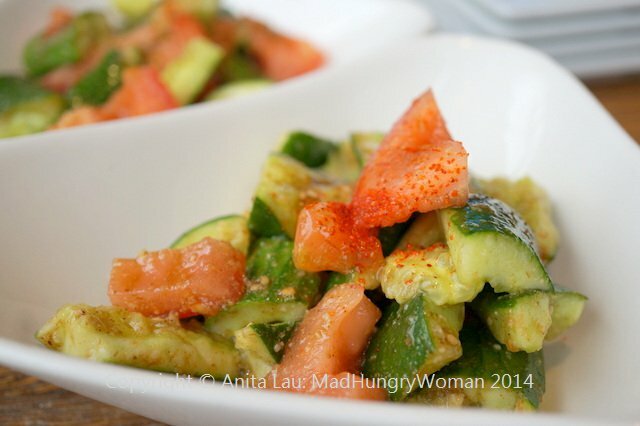 Cucumbers and vine-ripened tomatoes are marinated in Japanese pure sesame oil and red pepper chili oil. A refreshing salad of the spring time bounty you are finding at the markets right now. I like to eat it throughout the meal as a palate cleanser. I can’t eat chicken karaage anywhere else after having the Chicken Karaage ($5.95) here. My son asks every time if we can take an order to go. Usually, restaurants tend to cut the chicken into small pieces resulting in dry, tough chicken. Here, the chicken is left in larger chunks and allowed to marinate in a tasty blend of seasonings before deep-fried to a crispy perfection, leaving the chicken moist and juicy. 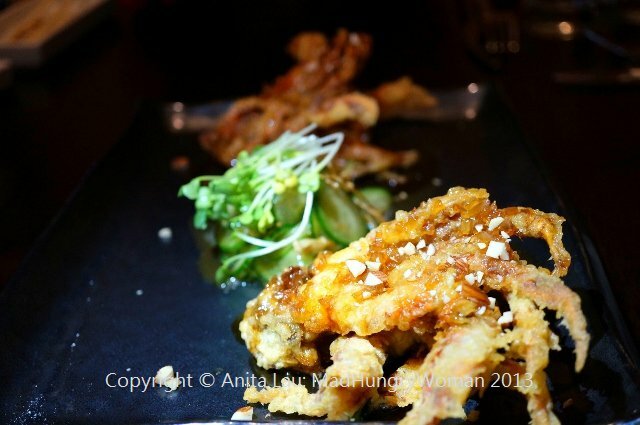 Served with house ponzu dipping sauce, the acid cuts the oil resulting in an addiction I can’t get over. A new item to fall in love with is Ikageso Karaage ($5.95), crispy deep-fried delicate squid with a side of spicy Japanese mayo. I don’t need it since I love them as is and take the leftovers home warming it up in the toaster oven for a snack the following day. 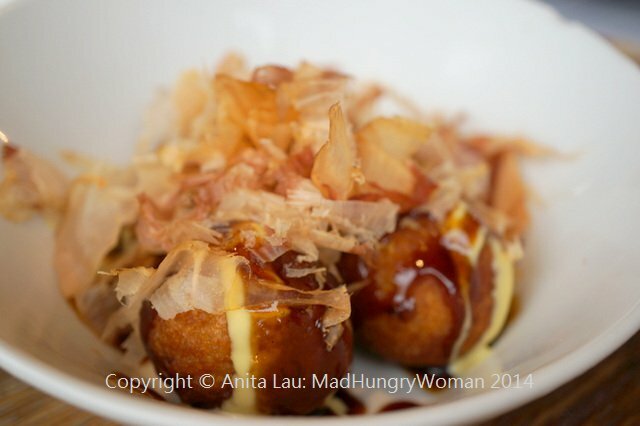 I have never been a fan of takoyaki until Rakiraki’s Takoyaki ($4.95). I generally do not like the texture of this Japanese street food because of its soft mushy texture. Here, the octopus balls are dotted with a rather generous amount of of tako (octopus) bits which add a nice variation of textures when you bite into it. The accompanying mustard mayo and takoyaki sauces are flavorful, but once again, I like to eat them au naturel since they are already drizzled with takoyaki sauce with a generous topping of bonito flakes, leaving them already well-seasoned. 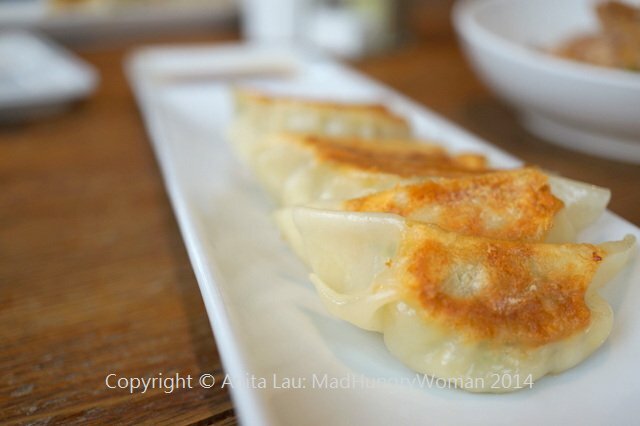 Chinois Custom Gyoza ($4.95) is always a hit with kids and adults alike. The wrappers are not thick and the filling light and nicely seasoned. After eating a very dismal ramen burger at the 626 Night Market recently, I promise my son he can order one here. 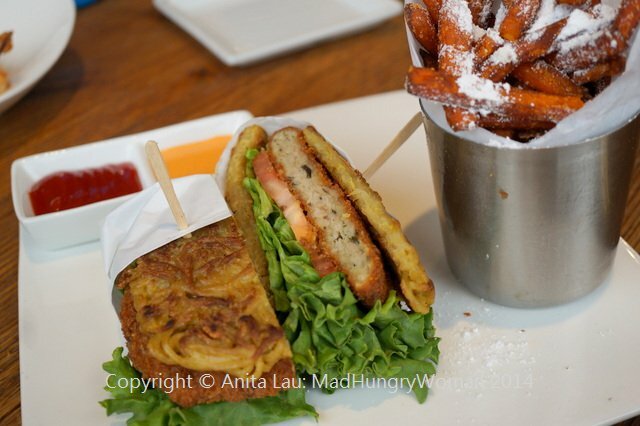 Tsukune Katsu California Ramen Burger ($9.75) does not disappoint. A tsukune katsu pattie is enveloped between a ramen noodle bun assembled with lettuce, tomato, spicy mayo and five-spice soy sauce using triple pressed ground chicken with shiitake and kikurage mushroom. The bun has a nice crispy texture on the outside and the chicken is beautifully seasoned. It is definitely redemption for us all. Some of my friends have never tried the curry here, so we order Beef Katsu Setagaya 27 Curry ($9.95) to share. I love the bold flavors of this curry — I’ve had it before many times always super spicy — we order it mild this time to suit everyone’s palates. The beef katsu is tender and absolutely perfect as leftovers the following day. But of course, what I am here for is ultimately, the ramen. Rikimaru Spicy Miso Tonkotsu Ramen ($12.75) — ordered super spicy — with flame blistered XO underbelly chashu is not only beautiful but tastes incredible. I’ve always stipulated that the broth at Rakiraki is phenomenal. Add to that perfectly textured double extra thick craft noodles and the smoky charred aromas of the underbelly and this is a bowl of absolute perfection. I am not about to leave without the Rikimaru Spicy Miso Tonkotsu Tsukemen ($11.75) with some of that delicious flame blistered XO underbelly chashu. Boy am I glad there are many of us sharing this. I know I’m supposed to be dipping my noodles into the dipping broth and not slurping it, but I can’t help it, it is just SO good. And how can we leave without trying the new Rikimaru Oxtail Ramen ($12.95). Those of you who love oxtail pho will love this item. A bowl of unctuous oxtail in a little broth is served alongside a bowl of premium rich and bold chicken broth ramen — utter perfection! Take a piece of oxtail, dip it into the ponzu, take a sliver of fresh ginger and put it in your mouth. Now take a bite of ramen. Repeat! I’m salivating as I’m writing this! There is no doubt that this is my favorite ramen spot in southern California. 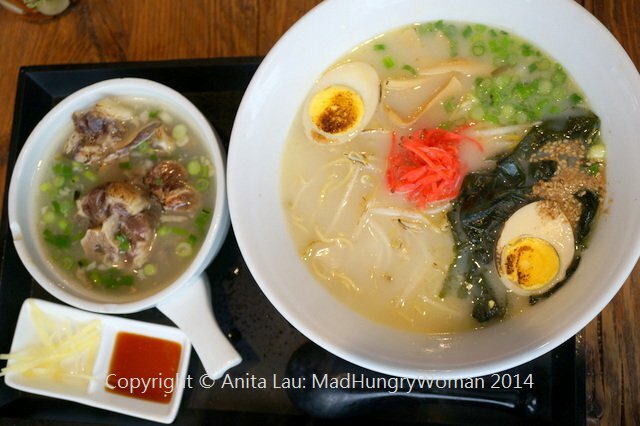 As much as I love Rakiraki, I can’t justify a three-hour return trip just for a bowl of ramen. I’m hoping they will open a location in Orange County soon. But in the meantime, whenever I’m down in San Diego, I make it a point to dine there at least once. It has been almost five years since I last visited Ikko. I remember the reason why we didn’t come back was due to their inflexibility when we dined with my son who wasn’t as savvy an eater as he is today. Ikko was one of those places which didn’t allow substitutions of any kind, nor will they make an exception when you’re dining with children. We ended up venturing to other Japanese restaurants which were more kid-friendly and I guess, just didn’t come back again. Last night, we came here for a friend’s birthday. It really upset me a lot for me to stay up all night to write this. I took a look at my old Yelp reviews and saw that I had lavished them with a 5-star rating two times before, but sadly, after this visit, that had to be dropped immediately. It started off rather well. 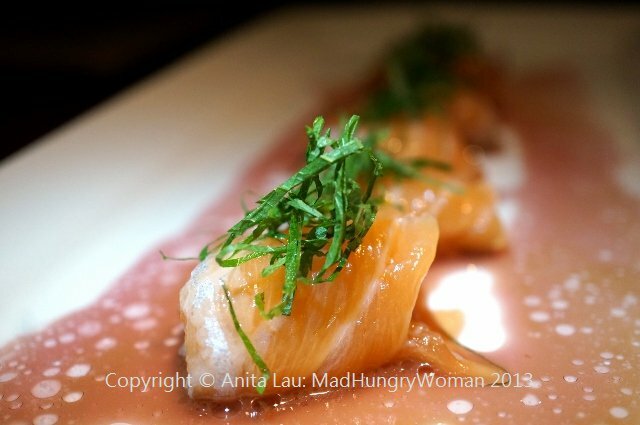 The Carpaccio of Salmon ($15.75) with squid cartilage rolled within the slices was delicious with a sour plum sauce which brightened the salmon and enhanced its flavor. 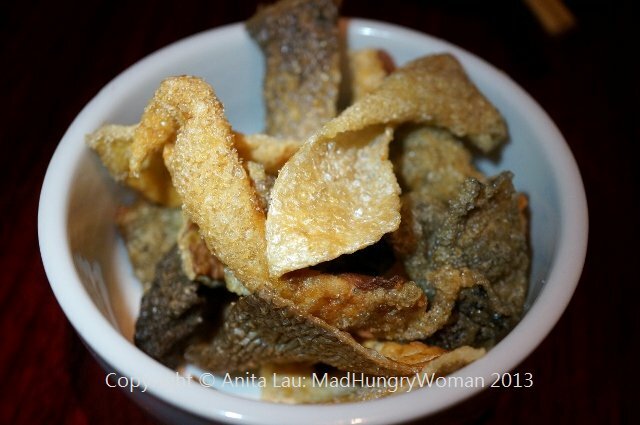 Assorted Fish Bones and Fish Skin Crackers ($2.95) — which we were told when ordering is only fish skin and no fish bones — is really tasty. Crispy like chicharron, but so much healthier for you. This I would totally order again. Then came an array of miso soups. Mushroom Miso ($3.25), Baby Clam Miso ($3.85) and Shizimi [sic] Clam ($3.50). 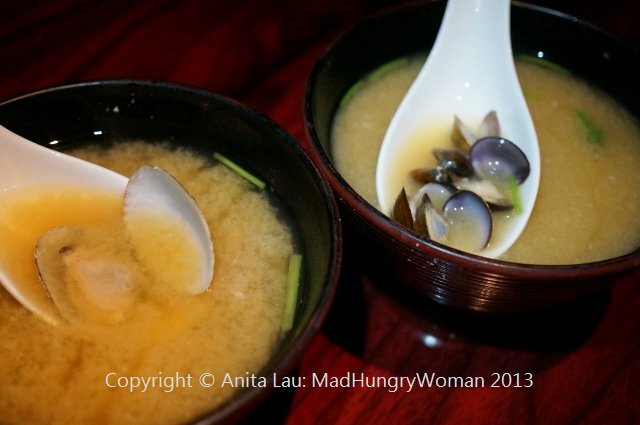 The mushroom miso was overly salty but both of the clam miso soups had a balanced flavor. My only issue with the baby clams was that they were gritty. I got mouthful after mouthful of sand from eating the clams. 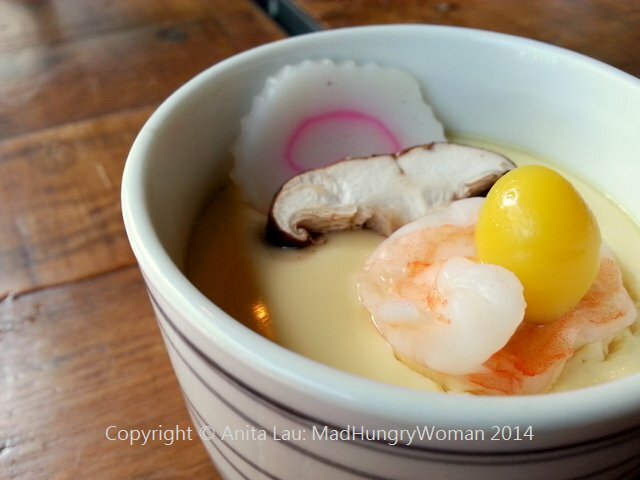 We also ordered both the chawanmushi (steamed egg custard) choices offered. Sea Urchin sauce & Black Truffle Chawanmushi ($8.75) was a waste of uni as the sliver was steamed along with the egg making it a crusty mess. Its texture was awful and was more for show than taste. Chawanmushi with Crab & Mochi ($7.50) was bland and frankly, the simple version I make at home from time to time is better than this. I was glad to have a decent dish arrive at the table. Japanese Eggplant Tempura with Wasabi Smelt Eggs and Spicy Tuna ($13.95) was a nice mouthful with beautiful textures and good flavors. 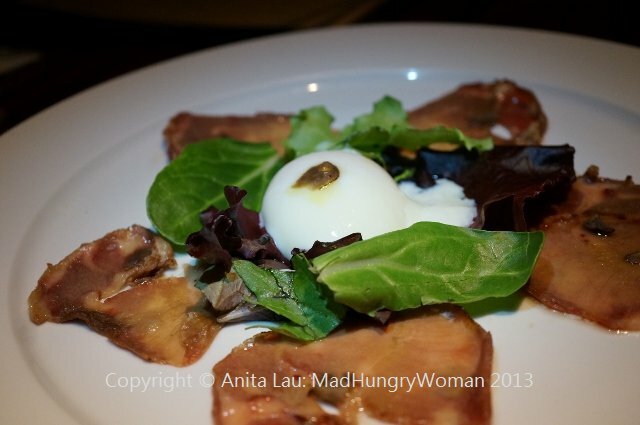 Black Truffle & Seared Beef Tongue Carpaccio ($20) topped with a soft boiled egg on top was literally, four mouthfuls. I remember lamenting about the four pieces of wagyu we had at Ink but this is far worse because tongue is not an expensive cut of protein. Perhaps the minuscule bits of truffle warranted the price of this dish, but my mouth doesn’t agree. The tongue was overcooked and chewy and no amount of seasonings could take away from that. 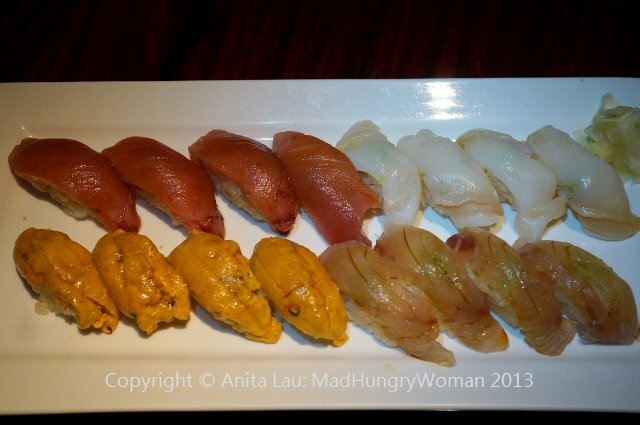 We also ordered some sushi including uni, blue fin toro, welk and black sea bream. The total of our sushi order alone was $76.90. The only thing I liked was the welk. The uni and toro had no umami whatsoever. The sea bream was okay, but none of it was seasoned correctly and they do not allow soy sauce at this restaurant. 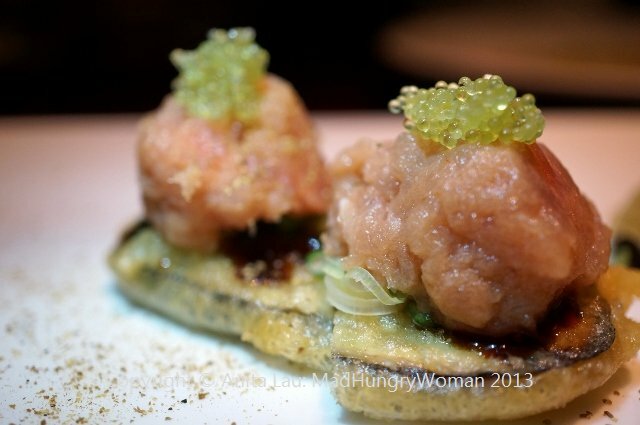 Smoked Orange Clam Adductor with wasabi ($4.50) was nothing special. It tasted like overcooked scallops. One of the best items of the night was Carpaccio of Octopus ($10.50) topped with a yuzu kosho vinaigrette topped with fried leek shards. 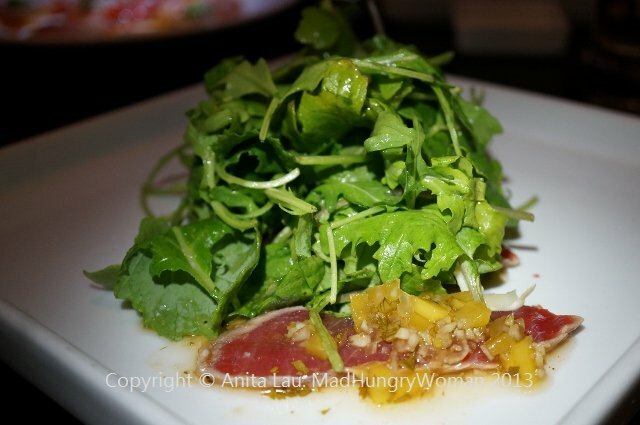 I love yuzu kosho so the flavors were very pleasing. The octopus was also nice and tender. Deep Fried Soft Shell Shrimp ($11) was also good. 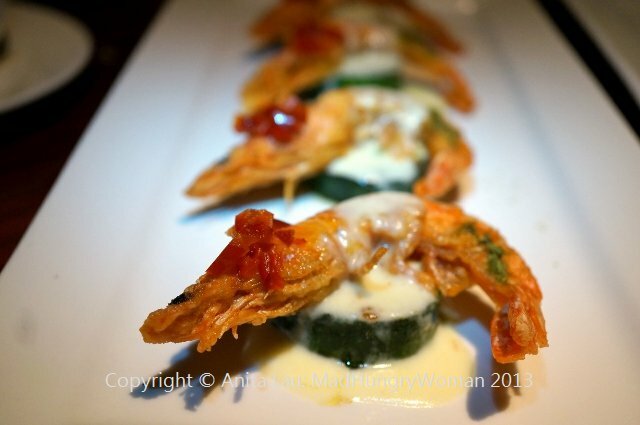 There were quite a few things layered on top of roasted zucchini rounds including three cheese sauce, sweet and sour red pepper and green tea salt, then topped with a fried soft shell shrimp. The biggest disappointment of the night was Grilled Channel Rock Fish ($12) with saikyo miso (a yellow miso paste from the Kyoto/Kansai region of Japan) and plum soy milk espuma (foam). The fish was overcooked and very tough. One would think with miso and plum soy milk, the end result would be one that was salty with some tartness, but the overall product was just bland. The fish needed salt and was such a let down on the palate. I think the general consensus was, if you’re going to be dictatorial about soy sauce (they do not allow soy sauce) or other condiments on the table, or even when asked, then season your food properly. It is highly frustrating when you are in the hands of chefs who do not salt proteins correctly. 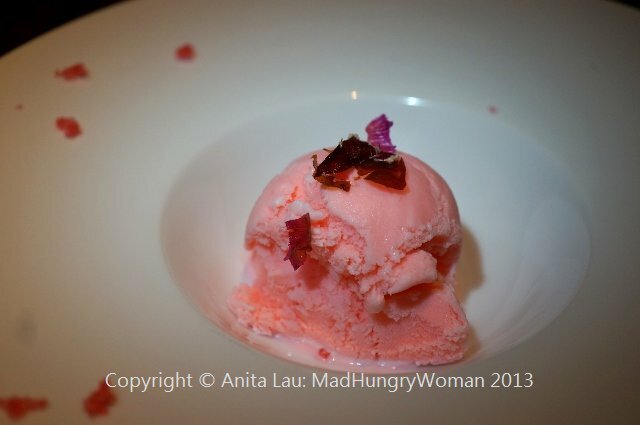 We did end with two desserts, the Rose Ice Cream ($4.75) with rose petal tempura topped with rose sugar sounded good on paper. I did not like the icicles in the ice cream at all. The rose sugar was devoid of any rose, not even a hint. 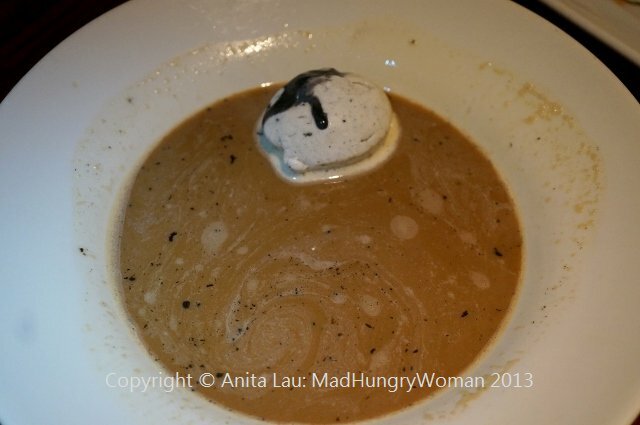 The Black Sesame Ice Cream ($4.50) with hot coffee and sesame seed paste sounded so good and I think we expected it to arrive like affogato would. Unfortunately, the plate arrives with a small scoop of ice cream already inside the pool of hot coffee. The ice cream was melting rapidly and I was lucky to get a shot of it before everyone dug in before it disintegrated. A subpar meal paired with lazy service just puts me over the edge. I don’t expect you to be at my table every five minutes asking me if my food is okay, but what I absolutely DO expect is that you check to see if my water needs to be refilled every 15 to 20 minutes. Or perhaps you can stop by to see if any empty plates needed to be removed? When our desserts arrived, our table was filled with empty plates which I had taken the liberty to stack, hoping they would take them away. What really was the icing on the cake (not in a good way) was the $300 check at the end of it all. If you’re looking for a worthy lunch from the OC Restaurant Week‘s lunch menus, look no further than Starfish in Laguna Beach. I have been to Starfish several times in the past but it’s been at least a year since I was last there. The first thing which struck me was that it wasn’t as dark inside as it used to be. I like it! 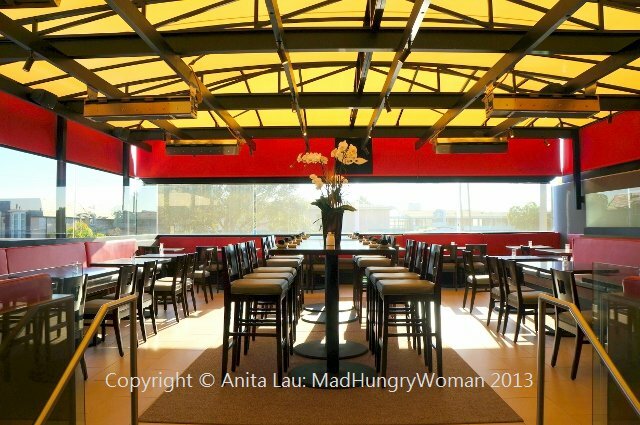 I am able to see inside the restaurant and most important, read my menu! There were four in our party and we were able to try a lot of things from the $15 lunch menu which offers up a 3-course meal. For starters, there were 8 items to choose from and then, an impressive 11 selections from the large plates along with three desserts choices. 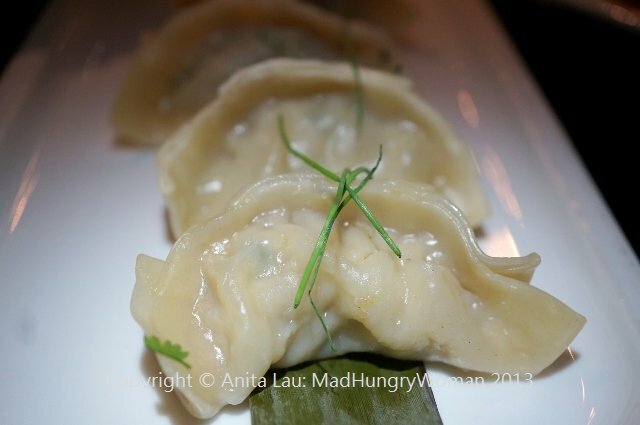 Pork Dumplings, filled with ground pork and Napa cabbage, you can have the option of steamed or pan seared. My friend chose steamed. They were decent and the skin to filling ratio was acceptable. I could taste that they were not previously frozen (it says handmade daily) and the wrappers were of a reasonable thickness. The accompanying scallion soy sauce is a good accompaniment. As for chili sauce if you like a kick with your food! Crab Wontons are not my thing because I just can’t wrap my head around cream cheese in Asian food. However, none of my friends seemed to mind as they gleefully chomped on the crispy wontons and proclaimed them delicious. 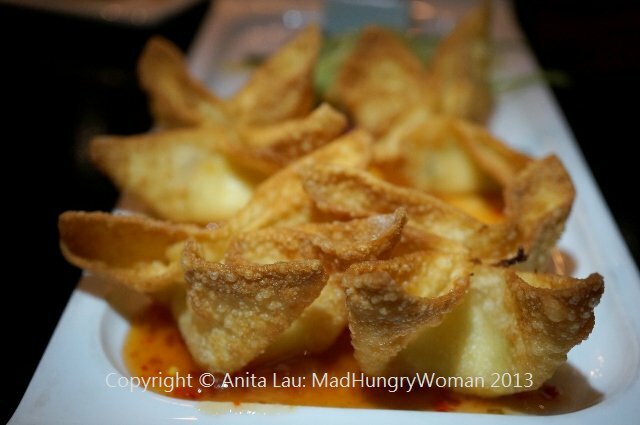 The wontons are filled with a blend of stone crab, cream cheese, red and green bell pepper, green onion, then fried and served with a sweet chili plum sauce. I loved the Chilled Cambodian Cucumbers and couldn’t stop eating them. 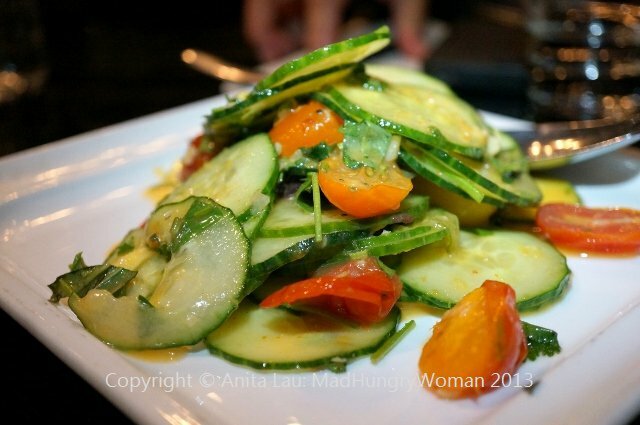 Sliced Persian cucumber rounds are tossed in a refreshingly light chili lime vinaigrette along with baby heirloom tomatoes, mint and Thai basil. My friend who ate my portion of the wontons said “you can have my cucumbers” — and I certainly did! 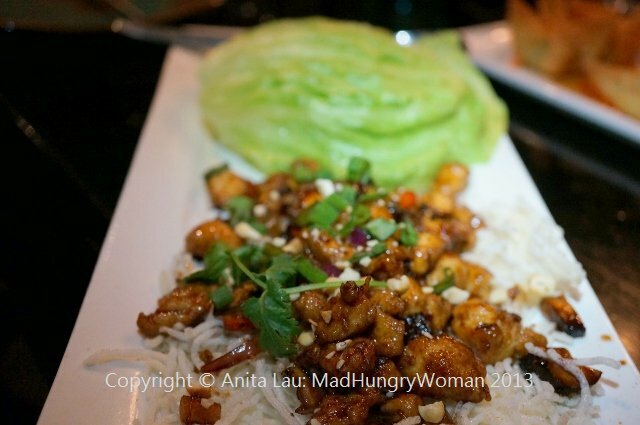 Chicken Lettuce Wraps were my favorite comprising diced chicken, shiitake mushrooms, caramelized onions, bell peppers and cashews in a savory sauce with a hint of sweetness. I usually dislike iceberg lettuce but they were perfect as cups for the chicken mixture. I could have eaten a few more of these. We were all very impressed by the portion size of each item. There was definitely no skimping going on here. When the entrees arrived, we were all pleased with the dishes we selected. 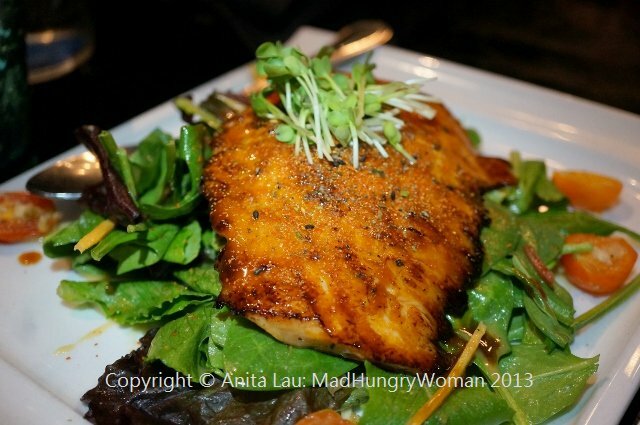 Shiro Miso Salmon Salad was a lot more generous than we had imagined with a nice sized piece of broiled miso marinated Atlantic salmon on top of organic baby greens tossed in a sesame miso dressing. The salmon was seasoned well and prepared to perfection. One of my friends is a very picky eater and generally stays away from anything “different”. She picked Mongolian Beef and was so pleased with it I could see she was tickled by her selection. 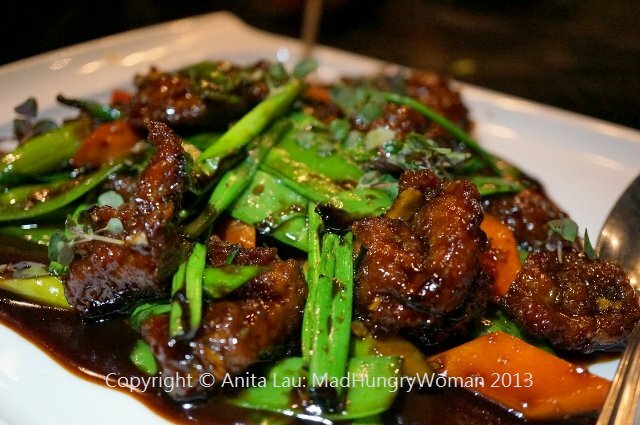 The tender pieces of beef are wok fried in a soy glaze along with snow peas, carrot, scallion and ginger. Because she was so happy, I nudged her to try some other things on the table as well. Sichuan Japanese Eggplant was my selection. 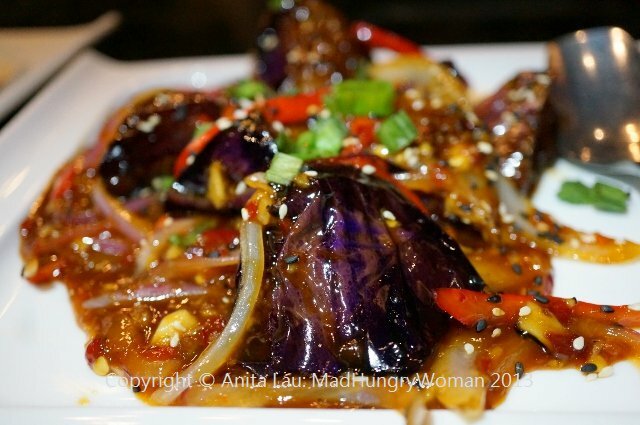 I am an eggplant fiend and I can eat it any way it is prepared. I can even eat it steamed with no seasonings — which makes my mother cringe for some reason. I’ve had this dish here before and I love it. Sauteed in a house made sambal sauce, Sichuan peppercorn, bell peppers and onions, I’m happy I wasn’t the only one who enjoyed it. 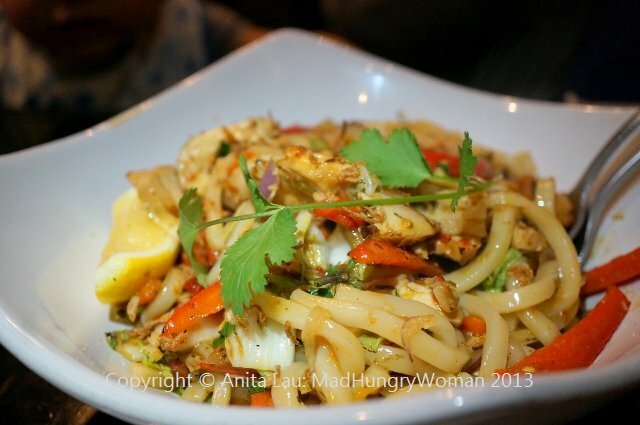 Another really tasty dish was Bangkok Spicy Udon Noodles. 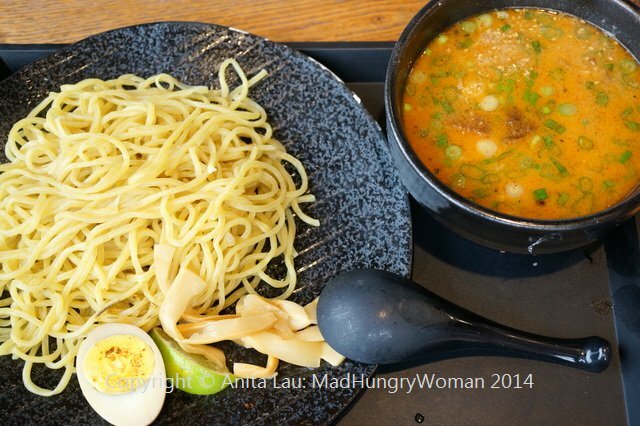 It is so unusual for restaurants to be so generous on the ingredients paired with a noodle dish and I commend Starfish here for this. Prawns, grilled chicken, green and red bell peppers, rainbow carrot, red and yellow onions plus Thai basil make up this incredible dish. I almost want to say there was a tad too much of the ingredients and not enough noodles. There wasn’t much room left for desserts, but we managed to polish off every little bit on the plate anyway. Chocolate Chip Bread Pudding was absolutely delightful. It was perfectly textured, not too eggy and caramelized bananas and house made cinnamon ice cream alongside. 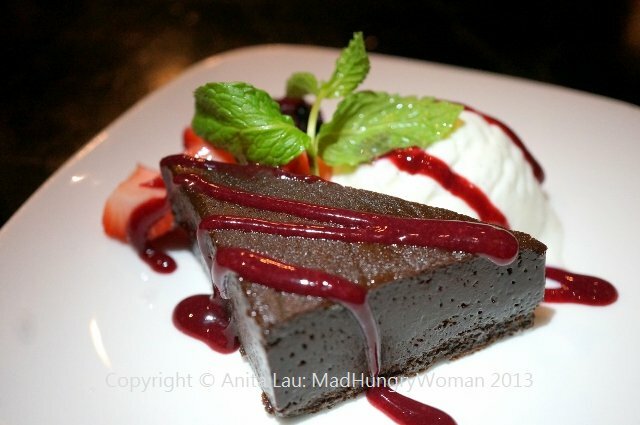 The Chocolate Flourless Cake was another winner with Tahitian vanilla ice cream and raspberry sauce. The menu states Thai tea caramel sauce as well but I didn’t detect that at all. However, everyone agreed, Mango Pudding was the best of the lot. 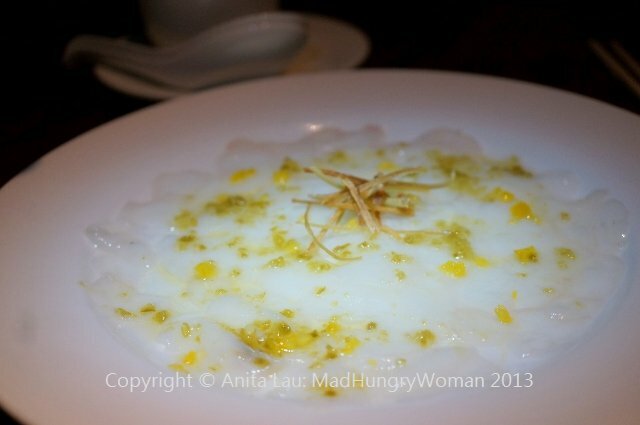 Silky mango pudding with vanilla bean coconut tapioca and diced fresh mango was just a perfect finish to the absolutely enjoyable meal shared with friends. 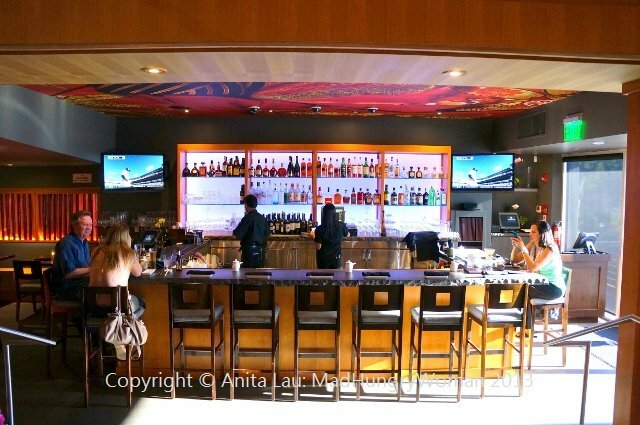 We came to visit the new Okura Robata & Sushi restaurant which took over the Katsuya location in Laguna Beach. I was never a fan of Katsuya so I was curious about this new place. The restaurant’s received a slight face-lift from before but still maintains a lounge-y feel in the bar area. The restaurant’s chic and modern feel extends even to the patio area and I can see girls’ night out happening out here with cocktails and a lot of fun. We were seated in the main dining room where I was able to get a good view of the sushi bar and the rest of the restaurant. 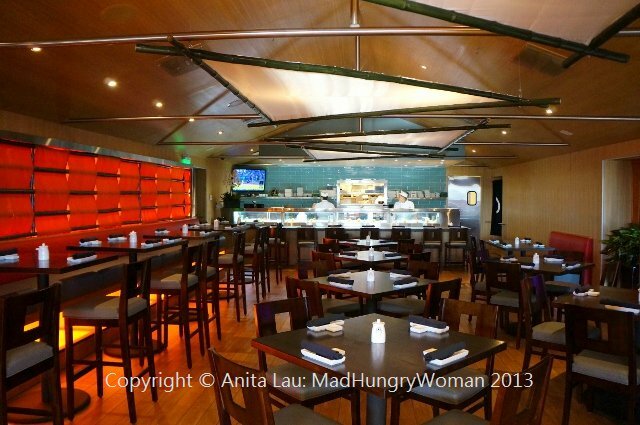 The menu is very safe, with sushi selections, familiar appetizers and a nice array of entrees which will appeal to all. Okura’s Executive Chef Jun Heo was named one of the Best Chefs in America by Best Chefs America 2013 and since it was our visit, the humble young man stopped by to give us some suggestions. 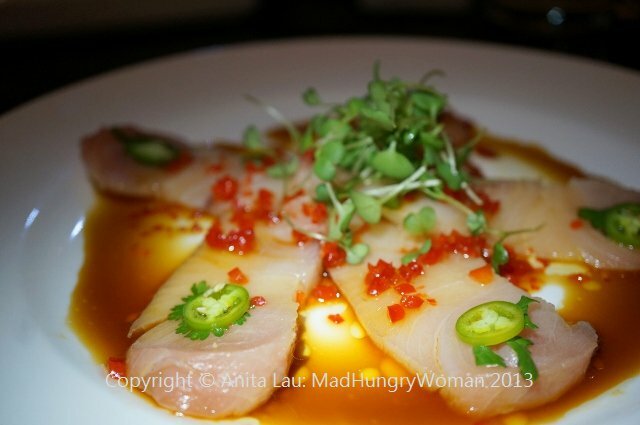 We started with Serrano Hamachi Carpaccio ($11), sushi grade hamachi (Japanese amberjack) bathed in a well balanced soy yuzu dressing without overpowering the subtle fish. The addition of fresh Serrano peppers tied the dish together by adding a little kick. Mango Seared Tuna Salad ($10) was surprisingly good. I wasn’t sure I would like the mango dressing with the tuna, but the sweet tart mango actually worked well without masking the tuna at all. Searing the tuna was a smart choice because it combined the delicate raw taste with the smokiness of the seared adding another dimension to it. At first glance, it looked like there was too much arugula kale salad on top but my son loved it and ate most of it. Guess there wasn’t THAT much after all. Since the restaurant possessed “robata” in its name, I wanted to try the robatayaki (grilled) items generally referred to items grilled over a charcoal grill strung on skewers. We tried the beef, chicken and the salmon, but my favorite was the latter. 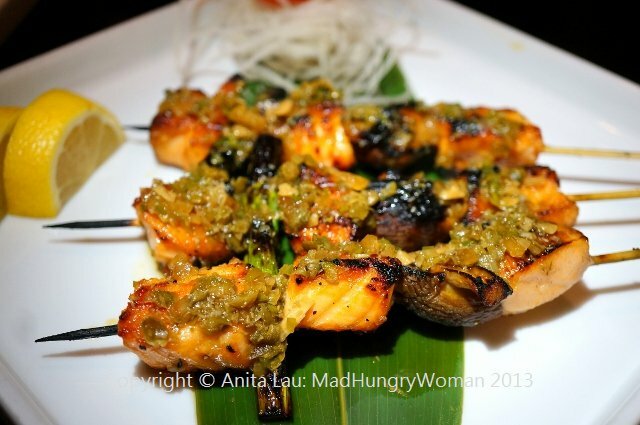 Salmon Robata Skewers (3pcs/$11) were beautifully prepared chunks of very moist and tender salmon. The topping of jalapeno salsa was absolutely delicious with a mix of salty, spicy and all around punch of salivating savoriness. 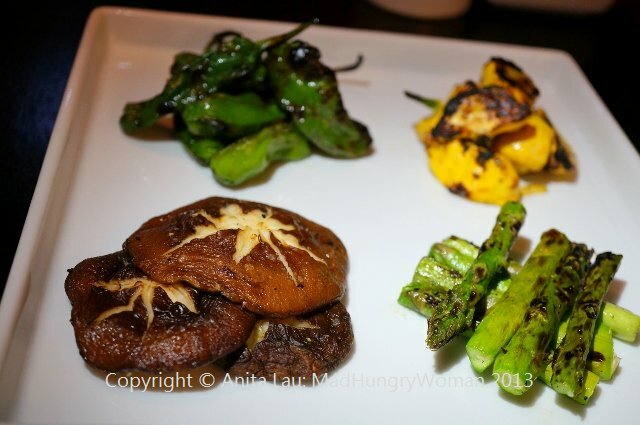 Grilled Vegetables ($9 ) were nothing special, but who doesn’t like grilled zucchini, squash, shiitake mushrooms and asparagus. I was very interested in the Vegetable Toban ($15) and had an idea in my mind from the description on the menu: “homemade vegetable broth with fresh seasonal vegetables and tofu”. I expected there to be more broth, more like a soup which the vegetable medley would be swimming in. The shallow dish it arrived in had a sauce which was bubbling away when it arrived at the table. There wasn’t much of it to begin with so most of it evaporated by the time we proceeded to eat it. A perfect dish for vegetarians to enjoy. 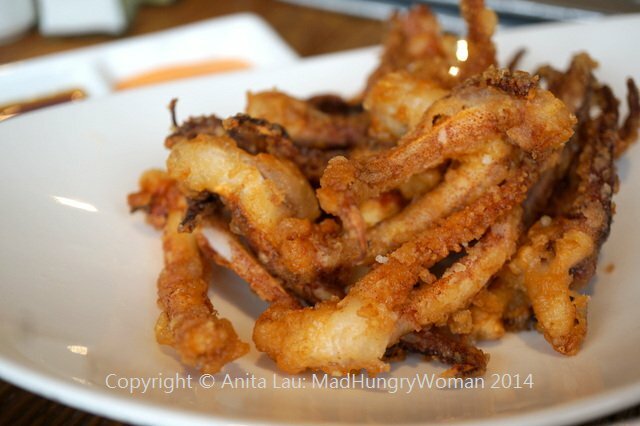 Crispy Soft Shell Crab with Mushroom Sauce ($13) was calling out my name and I absolutely had to eat them. I was very surprised at how generous this dish was. Two large crabs were split in half and fried to perfection. I was afraid the sauce would be too cloying but it was not. I would definitely order this again! I loved the use of a fried enoki ‘fan’ as a tasty garnish. My son wanted to try some sushi but I was too full for the sushi sampler. Instead Chef suggested the Seared Albacore Roll ($13) which I actually enjoyed. I’m not a big fan of rolls, but this one comprised of seared albacore and spicy snow crab, tobiko, gobo root and cucumber. The combination came together rather well and the various textures made it very enjoyable. There are still some hiccups here and there. Hopefully, after a few months, they would have worked them out and it will become a favorite in Laguna Beach. 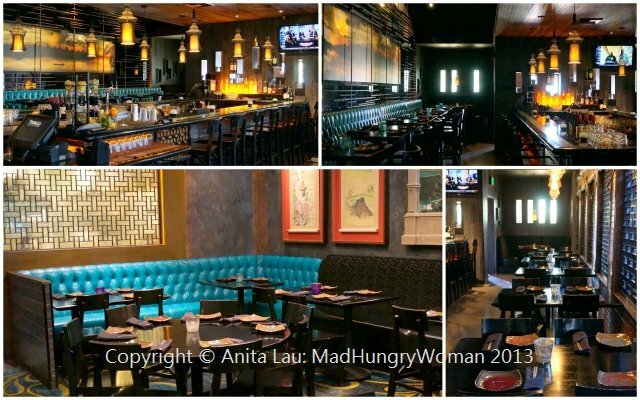 Recent reviews by Anita L.